You love surfing the Internet, but what you don't love is how easy it is for websites to track your identity and browsing behavior. If only you could put on a mask to hide your true self, letting you go anywhere you want on the Internet with wild abandon! But wait, that's exactly what you get with today's discount software promotion, Mask Surf Pro! Mask Surf Pro lets you surf the Internet completely anonymously, without requiring any complex configurations or steep learning curves. With Mask Surf Pro, you can engage in web browsing, instant messaging, and information sharing like chat rooms and forums without revealing your true identity. No application does a better job of preventing trackbacks and hiding your browsing history than Mask Surf Pro. Working in a way that is unlike all other anonymizing software, Mask Surf Pro provides the highest level of anonymity and communication security, repeatedly encrypting your data before sending it through multiple network nodes. Along the way, levels of encryption are peeled away to reveal further routing instructions, meaning that the origin, destination, and contents of your messages are never revealed to intermediary nodes! Bonus features of Mask Surf Pro include the ability to choose an IP of a specific region, letting you visit region-locked websites, online radio stations, and other web services. All of this, combined with the ease of an intuitive interface, makes Mask Surf Pro a clear choice for preserving your identity on the web! After you purchase Mask Surf Pro it may be used indefinitely. Mask Surf Pro is licensed per user, so if more people are going to use Mask Surf Pro you will need to purchase additional copies. I purchased Mask Everything Pro through Bits du Jour last December. You then revealed that the software wasn't compatible with Windows 8.1. "As I wrote we need to update our protection system to support Windows 8.x. It will take some time. Thank you for your patience." I chose to wait for an update instead of asking for a refund. Can you tell me if Mask Everything now works with 8.1? Justin Cram I have windows 8.1 and would like to use this Ip anonymizer will it work for my needs? If there a work around to make it work with windows 8.1 PRO WMC? If not how soon until it would? I would like to support this software! Could you confirm though that is in 36 months i'd have to pay again for upgrade or just to re-activate my license purchased here? Thanks again still awaiting answer for my previous questions also! Have you tried to install version 3.6 of Mask Surf Pro? For Everything problem was solved in June. Didn't try Pro because I bought "Everything". But I just checked your website and it seems that version 3.3 is the latest release. You wrote "I purchased MSP". 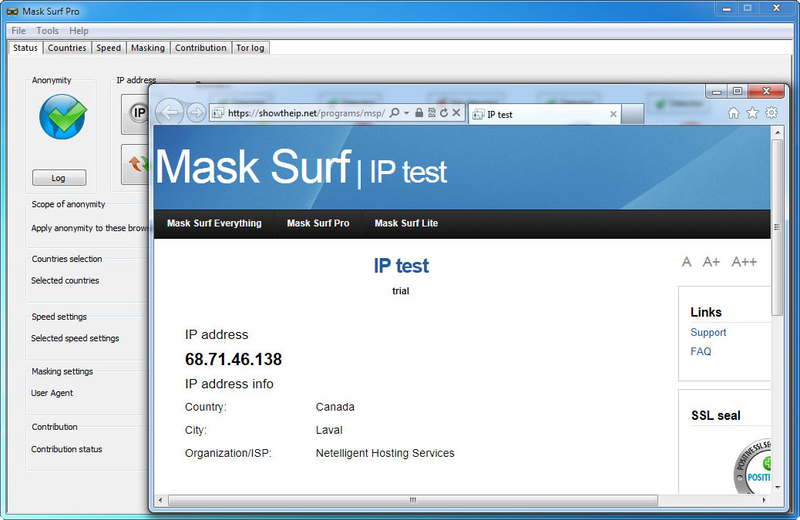 MSP is short form for Mask Surf Pro. If you have some troubles with last version of Mask Surf Everything please submit details to thanksupport.com right now and we will reply to you soon. Daryn Bogart Will this support not only Windows 8.1 but also Windows 10? Some of us are already running 10. 2014-12-13 Today, 2 months and 6 days later, I am still waiting for their response. Gerald Attrick Sounds like these folks have... uhm... less than sterling customer / product support service. In the absence of evidence to the contrary, I'm assuming this is just another product which attempts to find and use "free" public servers. It's been my experience the only thing that's free is the cost... and you get what you pay for (or don't pay for, as the case may be.) You think maple syrup runs slow during the winter? Contrary to what many children believe, folks, there ain't no Santa Claus. Take a look at a service called BOXPN. It'll cost you about three bucks a month and you probably won't notice any significant degradation of your DL speeds. You can take it for a free test drive. They support dozens of OpenVPN servers around the world. Their tech support service is terrific! Prompt turnaround and reps that know what they're talking about. I needed a little help converting to OpenVPN a while back and got it fast and effectively. Five stars on this outfit. Constantin Florea @Sandro Perotti, I have just contacted the vendor as well letting him know that you have been trying to contact him. Sandro Perotti @ Constantin Florea, thank you, let's see if it works. even one from Constantin Florea! CodeDog Update: Evgeniy did follow through with my issues from last year's purchase and they have been resolved. John Brazier Purchased this, had immediate problems with registration. When, after two months, that was fixed I found the IP address changer crashed the programme. Over a month later, still not fixed. The real problem is that given this level of quality, can you trust that it is protecting you? It's basically a layer over the Tor browser, which I have moved to. Can't recommend this purchase: and a message to BitsDuJour: selling this one is not enhancing your reputation! Sandro Perotti 7 months waiting. Even with your help I cannot solve my problem yet. These guys are totally unreliable and I don't understand how you (BitsduJour) keep selling it! I am sorry to say this, but this has reached outrageous after so many times it has been offered! Joe White Why this is being sold at all is a mystery to me! The statement "Working in a way that is unlike all other anonymizing software" is completely and totally false! What is described immediately following that statement, is an EXACT description of the TOR network/service. All of the "features" it lists thereafter are all features of TOR as well. Basically, they are selling a TOR client which is something that is normally and supposed to only be FREE. Not to mention, since this is ostensibly a closed source project it is also quite possibly less safe than using the real TOR programs and it cannot be checked for backdoors etc. There is certainly no way to be sure of this either way and that is frankly Very Scary! Tor is free software and an open network that helps you defend against traffic analysis, a form of network surveillance that threatens personal freedom and privacy, confidential business activities and relationships, and state security." So, if you actually want to be safe in your anonymity, have client software you can actually trust, actually get support AND not have to pay money for a lack of all the aforementioned, then head on over to https://www.torproject.org and you can get all that and much more at no cost! So download page at The Tor Project website offers two options now: Tor Browser or Expert Bundle. So it is up to you. You can stay with free Tor Browser which provides basic anonymity features or try Mask Surf. And there are more examples of using free open source technologies in commercial applications: sniffer programs use WinPcap network engine, video convertors use mpeg tools, etc. I hope I have answered your question. Jim Buchanan @Brian Fisher - I only received one key and am not sure which program it works for. So I had to assume it worked for both. Haven't tried to install yet.